Yes, Academy of Nutrition and Dietetics dedicates the month of August (right before school starts up again!) to all the kiddos and focuses on the nutrition needs and palates of the littlest people in our lives. And I have a great summertime dinner that not only pleases kids, but the adults too. Oh so cute and oh so delicious. And super easy to whip together, which makes them a great option for summer BBQs with a lot of people. Since these are really simple, grab yourself some really good ground beef. I really like these vacuumed-sealed pounds of beef. They freeze really well and I always have ground beef on hand for whatever I’m cooking. And I know that the amount is exactly one pound, which makes portioning a lot easier. Throw the ground beef into a bowl. Add some salt. And some pepper. Look how groovy this pepper mill is? It’s from Greece and is super fun to use. Oh the joys of being in your home kitchen. Mix the mixture together gently with your (CLEAN!) hands. See – simple! No muss, no fuss, no additional ingredients. Just perfect, simple hamburger meat. Grab a bit of the mixture and roll into a ball. About a golf ball-sized ball. And then flatten the ball into a patty. Using your thumb, make a divot in the center of the patty. This will allow the patty to cook evenly and not have a domed middle. 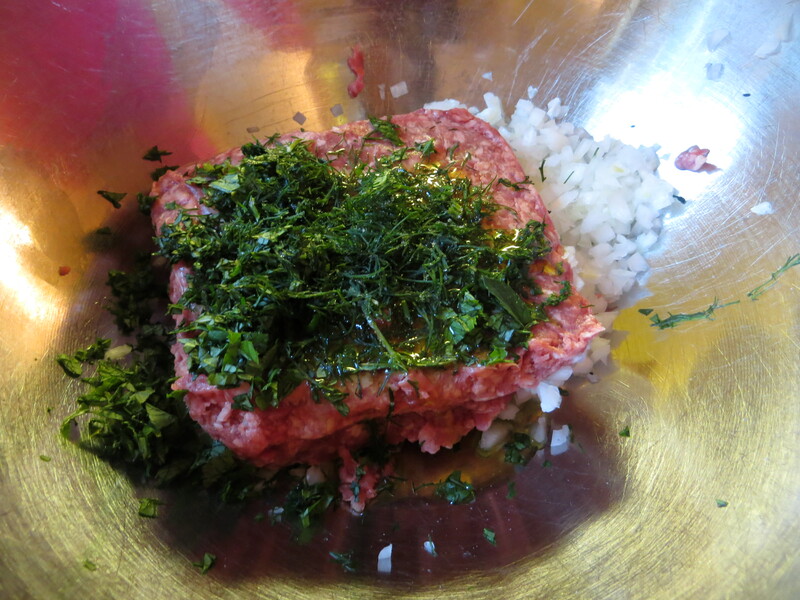 One pound of ground beef should yield 8 slider patties! Place in the fridge for about an hour (or longer if you want!). Then on a wicked hot grill, cook the patties for approximately 4-5 minutes per side or until they are cooked to your preference (I eat my sliders around medium, medium-well). 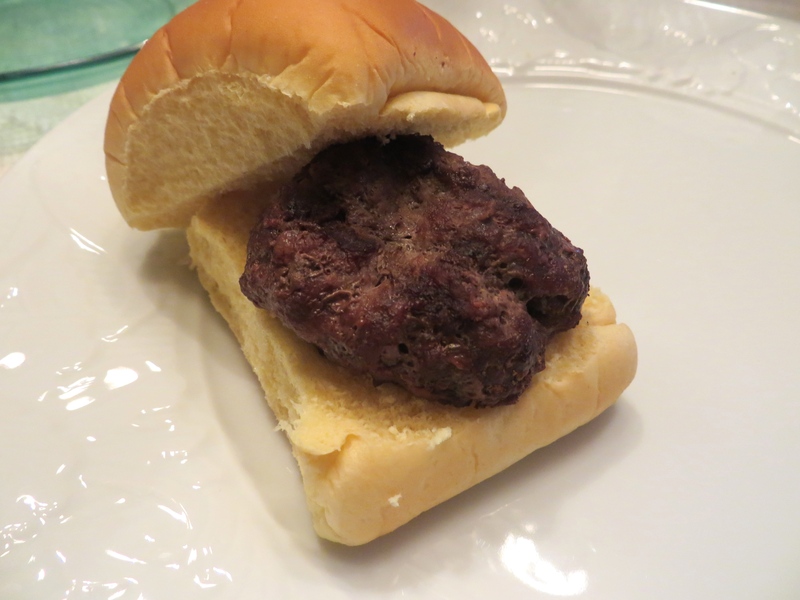 Serve on tiny hamburger rolls and add all your favorite hamburger fixins’… miniature sized! I like hot sauce on my sliders. Since they are so small (I usually serve two per person, or one per kid), everyone can customize each slider to their liking. I did one with hot sauce and caramelized onions and my second with ketchup and pickles. It’s perfect for people who like different toppings that they might not want to mix (Pepperonici and cheddar cheese together? No thanks!). 1. Combine ground beef, salt, and pepper in a large bowl. 2. Form 8 golf ball-sized balls. Flatten each ball into a patty, using your thumb to make an imprint in the middle. 3. Cook on your grill for 4-5 minutes per side. 4. Serve on mini-hamburger buns with all your favorite burger fixins’! When I was little, like 5 years old, my grandmother sent me a kid’s cookbook. How I loved that thing. The perfect introduction to the world of food and cooking! It was full of kid-friendly recipes, from French toast to egg salad sandwiches to the most amazing spaghetti with meat sauce. Or as the cookbook called it, Ready Spaghetti. But we called it Wonderful Dinner Option That Is (And Will Be) A Total Family Favorite For Ever And Ever. But Ready Spaghetti works too. While we still have the cookbook, the only recipe we still use from it (no surprise there!) is Ready Spaghetti… with a little customization. It all starts with some olive oil on the bottom of a high-sided skillet. 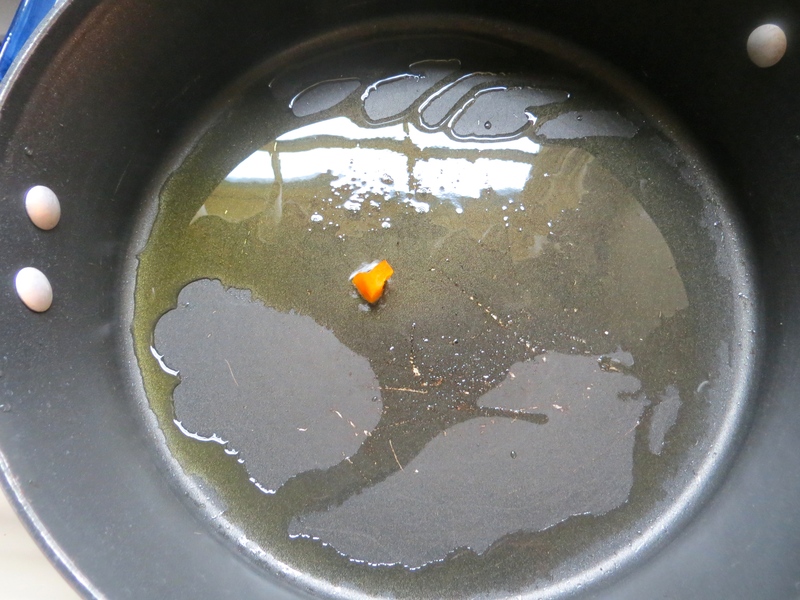 I test the heat of the oil with a piece of bell pepper. When the oil is hot, toss in some onion and bell pepper. 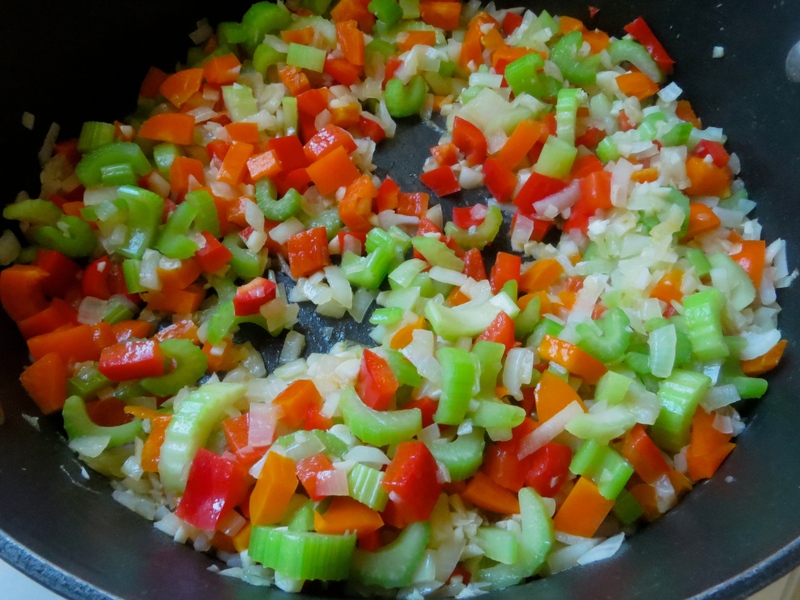 Sauté the peppers, onions, and garlic until they are soft and fragrant. I use 85-15 (85% lean, 15% lean) ground beef in this recipe. I know it’s a little extra fat, but it does add a good flavor to the sauce (and I deal with the extra fat in a bit). Break up the beef and cook through (no pink, please!). When the beef is cooked through, drain in a colander. So some of that extra fat gets drained off (and your sauce doesn’t get greasy). Now, here is the hardest part of this recipe. Open a jar of your favorite marinara sauce and pour it in. Stir to combine and add a little water or chicken broth if it doesn’t seem like there is enough moisture in the pan. Then add some salt and pepper. And some hot pepper flake (optional!). Simmer for 40 minutes and then add in one pound of cooked spaghetti. Toss to combine and dish out to your family and friends. The perfect meal for a cool, stormy summer night! 1. In a large, high-sided skillet, heat olive oil over medium heat. 2. Add onion, pepper, and garlic into the skillet and cook until soft and fragrant. 3. Add ground beef to the pan with the onions and peppers and brown thoroughly. Drain beef mixture in a colander to remove excess fat. 4. Pour the beef mixture back into the pan set over medium heat and add the jar of marinara sauce. Stir to combine. Add in water or broth if the mixture looks too thick and/or dry. 5. Add in salt, pepper, oregano, and red pepper flake. 6. Simmer sauce for 40 minutes. 7. Serve by either spooning over the spaghetti or adding spaghetti directly to the sauce and tossing it together.